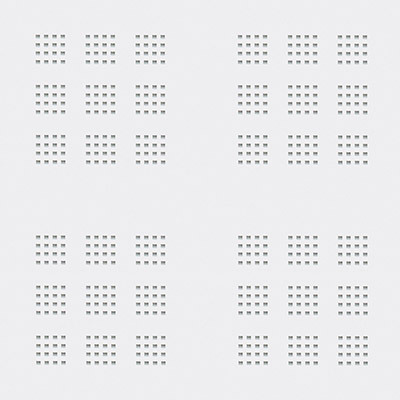 Contemporary grid-style perforated patterns for exceptional acoustic performance. Flexible and standard board options with built-in Activ'Air technology. Delivers a grid-format geometric effect for enhanced acoustics and style. Provides superior acoustics and a subtle pattern for added style. Achieves impressive acoustic control with a modern geometric pattern. Edge to edge pattern layouts for a monolithic, seamless design with Activ’Air technology and exceptional acoustic performance. Delivers an aesthetic impact and significantly improved acoustics. Features a regularly staggered, seamless pattern for enhanced acoustic performance. Delivers exceptional acoustic performance with a modern edge-to-edge perforation layout. Features an irregular scattered yet seamless pattern for an arresting aesthetic. Traditional pattern layout supplied without acoustic fleece backing – an economical aesthetic solution where moderate levels of acoustic attenuation is required. An economical sound attenuation solution with a simple, yet effective design. Installation accessories for the Gyprock Perforated Plasterboard range. Access Panels that blend almost imperceptibly into the ceiling with a perforation pattern that matches each of the Gyptone boards. Access Panels that blend almost imperceptibly into the ceiling with a perforation pattern that matches each of the Rigitone boards. The unique, seamless finish of Rigitone is made possible by the use of a specialised primer, filler and installation tools.